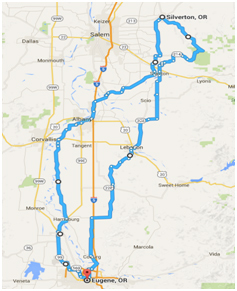 Only a few riders were able to make the date for a circle ride to Silverton, Oregon. The weather could not have been more pleasant as we headed north out of Eugene. Sticking to the paths less traveled we rode to Brownsville and then northward toward Silver Falls State Park. Highway 214 connecting Sublimity to Silverton is a beautiful little stretch of rural road as it curves and twists toward the state park and into Silverton. Once we arrived in Silverton we had coffee and lunch at one of the local downtown restaurants, Main Street Bistro & Coffee. This is a nice little establishment and worthy of a second visit. 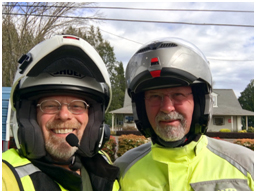 Of course we could not simply return home without stopping in Sublimity at Power Motorsports to kick a few tires and see what was new. Plenty of all makes and models, new and used, were on hand for our amusement. 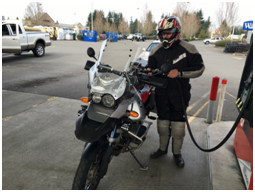 Tim Cruse fueling his GS. In closing, it was just a very nice uneventful ride – the kind we like. Good roads, good weather, good friends, good food, and good coffee to boot. Safe travels this riding season to all. 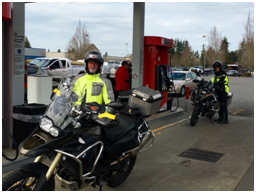 Butch Ferrand and Bob Whitlock at the pumps.